Solar photovoltaic (PV) systems are a great way to economically produce clean energy at a set cost, for years to come, and when sized appropriately, can go a long way toward helping a home or business achieve energy independence. And not only can going solar put money back in your pocket, but because solar power produces absolutely no emissions or other harmful side effects, it also helps support a future of cleaner air and fewer airborne pollutants. 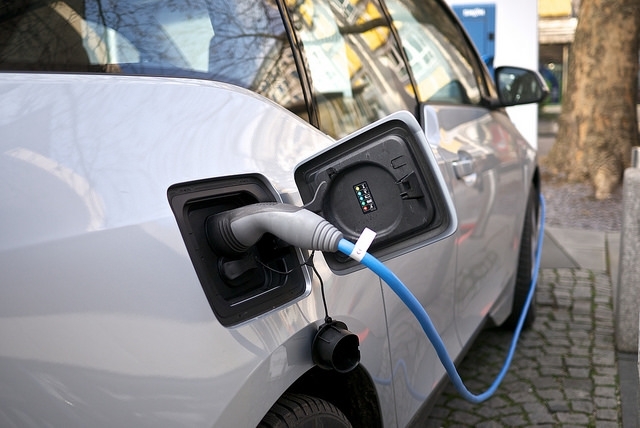 Plug-in electric vehicles are another emissions-free technology, and EVs offer a range of benefits to their owners, not the least of which is the savings on fuel, and when combined with a home solar power system, can be both a clean transportation solution as well as a money-saving strategy. Depending on your particular driving situation, and your region’s electricity pricing and solar incentives, combining a home solar array with an electric vehicle (or adding additional panels to an existing solar array to account for an electric car) might be an excellent investment, because not only can solar homeowners slash their electric bills each month, but they can also cut their fuel costs down to virtually nothing. Take the case of Peder and Julie Norby of Carlsbad, CA, who have a solar PV system and two electric vehicles and are trying to go for a full year of only solar-powered driving – true net-zero transportation. The Norbys had their original 7.5 kW solar system installed in 2007, which paid for itself in reduced electricity and fuel costs for their single EV by 2012. To accommodate an additional electric car, the Norbys added another 1 kW of solar panels to their array in the spring of 2014, boosting their solar capacity to 8.5 kW (capable of generating 13,000kwh a year), when they also took delivery of a pair of fully electric BMW i3s. Peder has been documenting their success at saving thousands of dollars in fuel and utility costs (essentially getting free fuel, and a net income from the system!) in the “Driving to Net Zero” energy challenge over at his site. Another solar homeowner was producing excess electricity from his solar array in Pennsylvania, so in order to take advantage of his own surplus of clean energy, he bought a Chevy Volt plug-in hybrid, which consumes about that same amount of electricity over the course of a year, reducing his vehicle fuel costs to a bare minimum. Neeraj and Archana Aggarwal decided to get a larger home solar system installed in order to power not only their house, but also a new BMW electric vehicle. In their location (Massachusetts), their home solar array could generate a significant amount of revenue through selling Solar Renewable Energy Credits, and would produce an annual return of ~20% on their investment, so they were sold on solar. The couple then chose to add additional solar panels to the original design of the home array (adding an extra $5300 to the cost), which would produce enough clean electricity over the course of the year to allow them to essentially fuel their electric car for free. They estimate that the additional investment for more solar panels will pay for itself in about two years, after which it will continue to power their electric car for decades to come. This couple, with a Chevy Volt extended range EV and 3.2 kW of solar panels on their roof, have been documenting their solar driving experience over at solarpowerelectriccars.blogspot.com. After three years of driving the Volt, covering some 50,000 miles, they were able to do over 29,000 miles on electric alone, saving over $1500 per year in fuel costs, while also powering their home and reducing their electric bill to a minimum. Charging your plug-in EV at night, during off-peak hours, not only takes advantage of lower electricity costs, but also ensures that your electric car is charged and ready to go in the morning, without ever having to make a stop at the gas station. And depending on your daily driving habits, you may not even have to fill up the backup gas engine in a plug-in hybrid very often at all either. Speaking of gas, if you’re the owner of an appropriately sized home solar system and an electric car, you can effectively avoid fuel costs for 25 or more years, while all the other drivers are seeing their gas and diesel costs (and taxes on fuel) go up every year. If you’re debating whether a gas hybrid or an EV would make the biggest financial difference in fuel costs, that depends on where you live, what your local gasoline prices are, and what your local electricity prices are, among other variables. But in many cases, including in most places in the US, just switching to an EV from an fuel-efficient gas car can save a thousand or more dollars in fuel costs each year, and if coupled with a home solar array, could be a big moneysaver. For those who have an electric car but no solar power, or have an EV with a home PV system, and want to recharge from the sun when they’re out and about, there’s a map of hundreds of solar-powered EV charging stations over at Solar Charged Driving. The US DOE has a couple of great primers at their Alternative Fuels Data Center website, including both fully electric vehicles and plug-in hybrid EVs, as well as a tool to compare the total costs of ownership (and emissions) for most makes and models of vehicles. One striking statistic on the site is the finding that a range of 100 miles is sufficient to cover 90% of household driving trips in the US, so an EV with a 100 mile range could essentially be used 90% of the time. The US Department of Energy also has a quick “eGallon” calculator, which can give you an idea of how much you can save on fuel costs with an EV instead of a gas car, and which claims that on average, it only costs half as much to drive an electric vehicle as to drive a gas one. That’s significant, and if you’re producing your own electricity on your roof, and you have an EV, you may be able to be completely free of fuel costs for many years. Plugin America has a great electric vehicle tracker, which currently lists at least 20 choices for EV consumer cars and trucks that are currently available in the US (there are plenty of other electric vehicles listed, including buses, tractors, motorcycles, etc. ), as well as examples of people successfully using solar PV and an EV to save gas and money. Another way to tell if an electric car is for you, and to see what your options are, is by using the Sierra Club’s EV Guide. And if you’d like a quick and dirty look at the solar power plus EV data, in terms of the appropriate size, the cost, and the payback period of the solar array and electric car for your situation, this calculator over at Sun Powered EVs will help you get your head around some of the numbers. If you’re considering buying an electric vehicle, then it may pay to also look at getting a home solar power system installed at the same time, or vice versa, if you’re thinking about going solar, then matching it with an EV that fits your needs at the same time may be the best way to go. Find out how you can join the solar PV plus EV revolution today!